Can’t see as well as you used to? Blame it on ageing. Like other parts of your body, your eyes lose their power as you age. Here’s what to look-out for, and how you can treat age-related complications. Presbyopia is the condition where you cannot see close objects or small print clearly. This is a normal, gradual process, but you may not notice any change until the age of 40. If you’re affected by presbyopia you may hold reading materials at arm’s length. You may have headaches or complain of tired eyes while reading or doing other close work. Presbyopia can be corrected with reading glasses and contact lenses. Floaters are tiny spots or specks that float across your field of vision. They’re most noticeable in a well-lit room or outdoors on a bright day. Floaters are a normal part of ageing, but can be a sign of a more serious eye problem like retinal detachment (when the retina pull away from the back of the eye), especially if they’re accompanied by light flashes. If floaters bother you or impair your vision, see your doctor immediately. He may suggest surgery called a vitrectomy to remove some or all of the floaters. Dry eyes are when your tear glands can’t make enough tears or produce tears of a poor quality. This can make your eyes itch, burn, and turn red. If untreated, you could lose some of your vision. Dry eyes can be treated with special eye drops that stimulate tears. Your doctor may also suggest a humidifier for your home. If you have a severe case of dry eyes, tear duct plugs, prescription eye drops, or surgery may be needed. Have your eyes tested once every two years until the age of 50, and every year after that. An eye test can pick up disorders in their early stages, and treat them before it’s too late. Wear the right lenses. The correct prescription lenses can improve your quality of life, and lower your risk for accidents and injuries like falls. 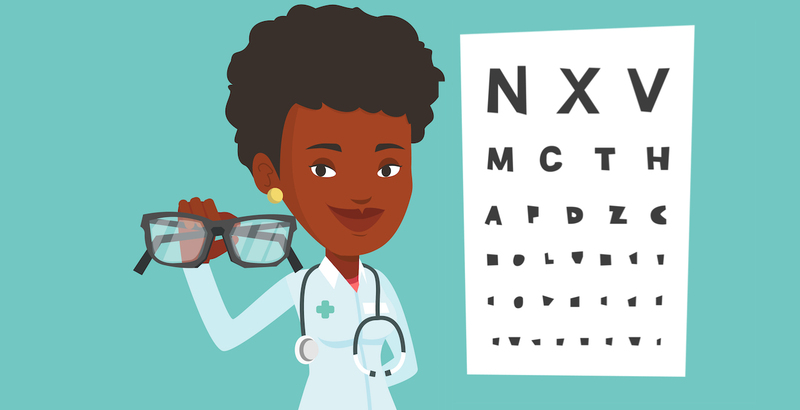 An eye test can help determine whether you need a different prescription. Light it up. Your eyes need three times as much light when you’re 60 as they did when you were 20. Welcome daylight into your home. Keep your windows clean and curtains pulled back. Keep your home nicely illuminated. For reading or work that needs you up close and personal, use a direct light from a flexible table lamp. Position the light so that it doesn’t reflect in the page and cause a glare. Eat eye-healthy foods like kale, spinach, and other leafy greens. These foods contain powerful antioxidants called carotenoids, known to maintain healthy eyes and ward off eye disease. Food rich in Vitamins A and C like carrots, strawberries, pumpkin, corn, and sweet potato can also improve your vision and lower your risk for eye problems. Foods high in Omega-3 fatty acids like tuna, salmon, and sardines can strengthen your eye muscles for better vision, and prevent dry eyes. Good Vitamin E foods like almonds, peanuts, and avocados have the same effect. Drink enough water every day. Water can prevent dehydration, and stop dry eyes in its tracks. Exercise regularly to improve blood flow to your eyes, and reduce your risk for eyesight issues. Keep your health numbers (blood pressure, blood sugar, and waist size) in check. Hypertension, diabetes, atherosclerosis, and being overweight have been linked to vision loss. Follow a healthy lifestyle, take your medication as prescribed, and go for regular check-ups. Get a good night’s rest. Sleep is your eye’s natural way to self-cleanse, and get rid of dirt and debris that may have accumulated during the day. A lack of shut eye may lead to eye pain, redness, light sensitivity, dry eyes, and blurred vision. Put on a pair of sunnies. Direct sunlight can hurt your eyes and interfere with your vision. Always wear sunglasses with a built-in UV filter to protect against harmful rays. Stub out cigarettes for good, and avoid secondhand smoke. Smoking can irritate your eyes, and cause irreversible eye damage.